The red imported fire ant, Solenopsis invicta, continues to spread across North Carolina due in part to favorable climate conditions that aid its natural spread. At the same time, increased residential and commercial development contribute to their spread in infested sod, nursery stock, soil, wheat strawe and other materials. Although fire ant stings are not fatal for most people, they are painful. Eradicating fire ants is difficult and not really practical in many cases. However, you can manage infestations and reduce the risk of getting stung. Fire ants are native of southern Brazil. They currently inhabit eleven southern states, as well as isolated areas in New Mexico and California. In North Carolina, imported fire ants can be found in at least 75 of our 100 counties, including isolated areas in western North Carolina. These areas (shown in red on the North Carolina map shown here) are currently under quarantine by the US Department of Agriculture (USDA) and the North Carolina Department of Agriculture & Consumer Service (NCDA&CS), regulating the movement of certain items that might carry ant infestations to other uninfested parts of the state and country. In 2019, the North Carolina Quarantine will expand to include all of Davidson, Orange and Vance Counties (see 2019 map). Distribution of fire ants in the United States. 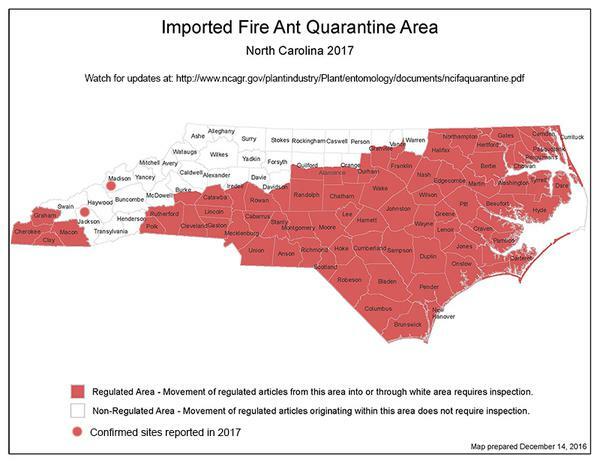 North Carolina Fire Ant Quarantine Map (2017). 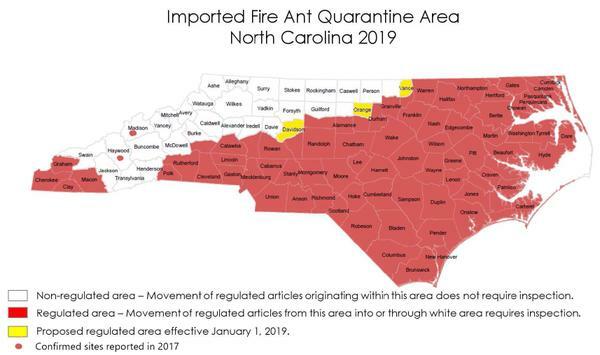 Proposed 2019 Fire Ant Quarantine Map for North Carolina. From an agricultural perspective, red imported fire ants are nuisances primarily because they annoy field workers and because their mounds may damage harvesting equipment. Livestock injury and crop damage are usually minor here. The ants can also damage electrical wiring which can disable equipment. 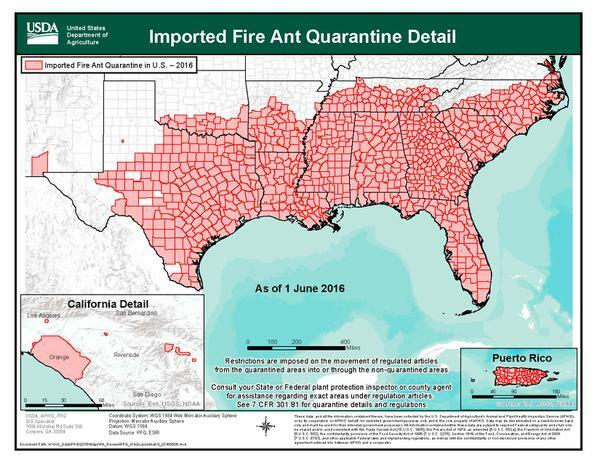 Fire ants have a much greater impact on the ornamental plant, sod, and landscaping industries because of problems associated with shipping potentially infested plant material or soil into uninfested areas of the state and the country (see the section below entitled "Quarantine Assistance”). Mounds discovered in previously uninfested areas of North Carolina are frequently traced to landscaping performed at commercial and residential developments. For the general public, two aspects of red imported fire ant infestations are particularly annoying: the unsightly mounds formed in lawns and yards and the painful stings received when mounds are disturbed. Within 24 hours after a person is stung, a pustule-like sore often forms at each sting site (as shown here), which usually itches intensively. Scratching the pustule may rupture the skin, leading to secondary infection and scarring. A small number of people are highly allergic to fire ant stings and requires immediate medical attention. As red imported fire ants spread into more populated areas of the state, more people are likely to be stung. Occasionally, foraging ants invade homes and commercial buildings such as offices, hospitals, and nursing homes. In some instances, you may see soil pushed up along an expansion joint of building constructed on a slab (instead of a basement or crawlspace). In these situations, fire ant control is more critical and potentially more difficult because of concerns related to both the ants and the indoor use of chemical insecticides. Adult red imported fire ants are reddish to dark brown and occur in five forms: (1) minor workers, about 1⁄8 inch long; (2) major workers, about 1⁄4 inch long; (3) winged males and (4) males, each about 1⁄3 inch long; and (5) queens, about 1⁄3 inch long. Fire ant mounds vary in size but are usually in direct proportion to the size of the colony. For example, a mound that is 2 feet in diameter and 18 inches high may contain about 100,000 workers, several hundred winged adults, and one queen. If you break open an active fire ant mound, you typically find the "brood" - whitish rice grain-like larvae and pupae. These immature ants will eventually develop into workers or winged adults. Mounds are tyipcally constructed in open sunny areas. Those mounds constructed in clay soils are usually symmetrical and dome-shaped while mounds built in sandy soils are often irregularly shaped. The red imported fire ant can be difficult to distinguish from the tropical fire ant and the southern fire ant, which are also found in North Carolina. For positive identification, take a specimen to your county Cooperative Extension center. During the spring and summer, winged males and females leave the mound and mate in the air. After mating, females will form their own nests. They may fly as far as 10 miles from the parent colony, although most queens descend to the ground within much shorter distances. Only a few of queens survive after landing. Most queens are killed by foraging ants, especially other fire ants. If a queen survives, she sheds her wings, burrows into the ground, and lays eggs to begin a new colony. In the late fall, many small colonies of fire ants will appear. Many of the colonies will not survive the winter unless the weather is mild. 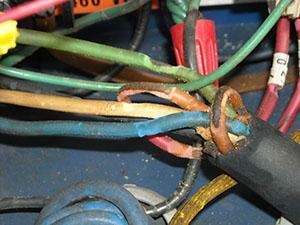 Fire ant damage to electrical wiring in pump equipment. Soil pushed up around an interior expansion joint of a house could mean fire ants have moved into a wall or subfloor void. Fire ant mound in field. 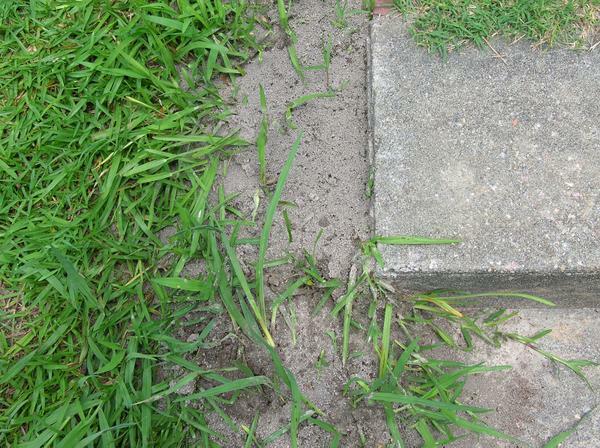 Fire ants will build mounds around edges of sidewalks and slabs. Winged fire ant "swarmers" and wingless workers on a weeds near a mound. Controlling fire ants in landscaped areas and around buildings and other areas used by people is important and requires an Integrated Pest Management (IPM) approach. First, fire ants prefer oily and greasy foods. They also feed on many other insects and, from that standpoint, could be considered beneficial. To find food, workers forage around their mound traveling in underground tunnels that radiate from the mound and then onto the surface. If the mound is disturbed, ants swarm out and sting the intruder. As with any other insect pest, fire ants spend a great deal of time searching for food. That foraging activity can bring them inside buildings. You can reduce ant foraging around buildings by eliminating available food sources in these areas. 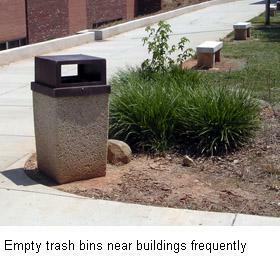 Outdoor trash cans around schools, parks, and other buildings should be emptied frequently during the day. Avoid leaving trash in them overnight. Keep the area around trash cans clean. Dumpsters and grease bins (at food service facilities) should be emptied routinely and the areas around them kept as clean as possible (clean up spillage as soon as possible). Keep shrubs pruned away from the building so that ants can't use them as a "bridge" to avoid treated areas. Because fire ants can be spread in new landscape material such as shrubs, sod, wheat and pine straw, check these items carefully before you purchase them or have them installed. If you are doing your own landscaping there is a chance you could get stung while handling fire ant infested items. If you find fire ants in plants, sod, pine straw or wheat straw, contact the supplier immediately. There are two basic approaches to chemical control of fire ants: an insecticide can be applied to individual mounds or it can be broadcast over a wide area that is infested with fire ant colonies. Individual mound treatments are often more environmentally and ecologically acceptable because they use less insecticide and limit the amount of area treated as compared to broadcast treatments. This approach also reduces the impact on non-target insects ground-dwelling insects (including other ant species). Regardless of the method used, the objective is to kill not only the workers but also the queen because she is the only ant in the colony that is capable of laying eggs. Always follow the label directions when applying any fire ant insecticide. Distribute uniformly over mound. For best results apply early in morning or late afternoon. Apply as a mound treatment or broadcast bait. Use as a mound drench. Toxic to fish and aquatic invertebrates. Do not apply near or allow runoff to surface waters or intertidal areas. Mound treatment. Acceptable to organic growers. May also be used around fruit and vegetable gardens. Apply as a broadcast. Irrigate prior to treatment. Follow label directions precisely. Use fresh bait. Repeat treatment usually required. Mound or broadcast. Follow label directions. Repeat treatments usually required. Follow label directions precisely. Repeat treatments usually required. Use fresh bait. Found in broadcast or mound treatment packaging. Many pyrethroids are toxic to fish and aquatic invertebrates. Apply these products only as specified on the label. Acceptable to organic growers. Follow label directions precisely. Repeat treatments usually required. Use fresh bait. May also be used around fruit and vegetable gardens. Individual mounds may be treated with a liquid or dust insecticide formulation or with an insecticidal bait. Liquid treatments may be done by rodding the chemical deep into the mound or by drenching the mound. To be effective, the drench must penetrate throughout the mound and contact most of the fire ants in the colony. Ants coming into contact with the drench die soon after. Drenches are the preferred treatment when the risk of human contact with fire ants is high and the fire ant infestation must be eliminated immediately because of the health risks of someone getting stung. High-risk areas include home lawns, school and child care properties, parks, and other areas frequented by the public. Best control results are usually obtained in spring and fall when temperatures are between 70 and 85°F. Control with mound drenches can be more difficult during very hot summer months because the ants often remain deep within their mounds and are hard to reach with liquid insecticides. In the summer, drenches are best done in the morning or evening. Contact your county Cooperative Extension center or consult the North Carolina Agricultural Chemicals Manual for information on fire ant insecticides appropriate for use by the general public and by public health and pest management professionals. Following label directions, pour the correct amount of water into a bucket or sprinkler can. Add the prescribed amount of insecticide, mix well (without splashing), then gently pour the diluted insecticide over the surface of the mound. Apply the drench at a rate of approximately 1 gallon per 6 inches of mound diameter. At this rate, for example, a mound measuring 12 inches across would receive 2 gallons of insecticide drench. The amount of drench applied is more important than the concentration of insecticide in the drench. Thoroughly wet the ground to a distance of about 2 feet around the mound. Sometimes the drench does not kill all of the ants in the colony and the surviving ants will construct small mounds within 10 to 15 feet of the parent colony. Several days after the application, search the area around the treated colony for new mounds and drench them as well. Keep children and pets away from the treated area until it is dry (or as designated on the pesticide label). Also, if you use a water bucket, rinse it immediately three times before using it for any other purpose. Also, many pesticides are not labeled for use in fruit & vegetable gardens and around livestock and poultry. Always read the product label to make sure that it is appropriate for the particular situation that you have. Professional products for turf applications can be found on the Turffiles website. Contact your county Cooperative Extension Center or consult the North Carolina Agricultural Chemicals Manual for information on fire ant baits appropriate for use by the general public and by public health and pest management professionals. Use fresh bait. Remember that the food portion of the bait must be attractive to the ants. Old bait (particularly past its expiration date) will not attract the ants to feed on it. You can test the bait by putting some out where ants are active and see if they take it. 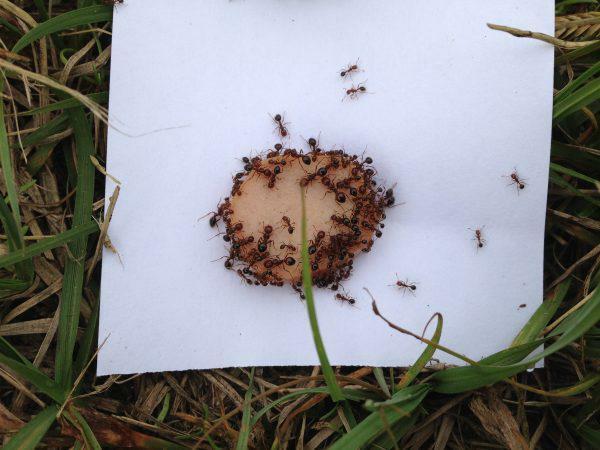 In the spring when ant foraging first starts to increase, you can gauge ant activity by placing pieces of hot dogs or potato chips in areas of known or suspected ant mounds. Watch for ants to start feeding on the food items and then apply the bait as needed. At that point, baiting is likely to be more successful. Apply the bait according to label directions. Sprinkle the recommended amount around each mound (not on top of the mound itself). It is best to apply the bait in the early evening. Many bait labels recommend that the material not be applied within 6 hours after rainfall or heavy dew. Moisture can lead to the bait’s attractant oils becoming rancid and less attractive to foraging ants or may cause the bait granules to lodge in the grass foliage and so the ants do not readily find them. "Two-Step Method" - A highly effective (but requiring more effort) is the "two-step method." Place the bait out around a mound. Wait about 5-7 days. Then, apply a mound drench which should kill the remaining workers more quickly. Broadcast treatments can be used to apply insecticides (liquids, baits, or granular insecticides) over a large infested area containing many fire ant colonies. One disadvantage of broadcast treatments is that they can also disrupt other ant communities. Although most people think of ants strictly as being pests, they are also a very important parts of our ecosystem. Broadcast treatments can result in an ant community changing from one that is dominated by native ants to one dominated by imported fire ants. On the other hand, in areas with very high mound densities, broadcast applications allow large areas to be treated quickly. Areas of high public use may be protected by spring and fall broadcast applications of ant bait or a well-timed granular insecticide. One limitation on the use of granular insecticides (not granular baits) is that most of them require water (either from rain or by irrigation) to be applied shortly after the application. When rain is not expected for several days or in areas where watering may be restricted or not feasible, a granular insecticide may not be the best choice. 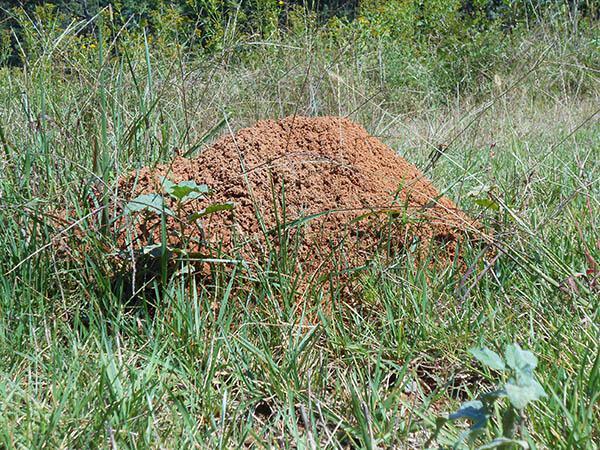 If the area becomes reinfested with fire ants during the summer months, individual mounds can be treated with an insecticide drench or ant bait, although as noted previously control is more difficult when temperatures are high. Consult the North Carolina Agricultural Chemicals Manual for a list of granular insecticides (and baits) that can be used against fire ants. The key to reducing the threat of fire ant infestations indoors is prevention, which means removing exposed food sources that may attract these insects. In some cases, fire ants may nest indoors, e.g., inside walls or partially under concrete slab floors. 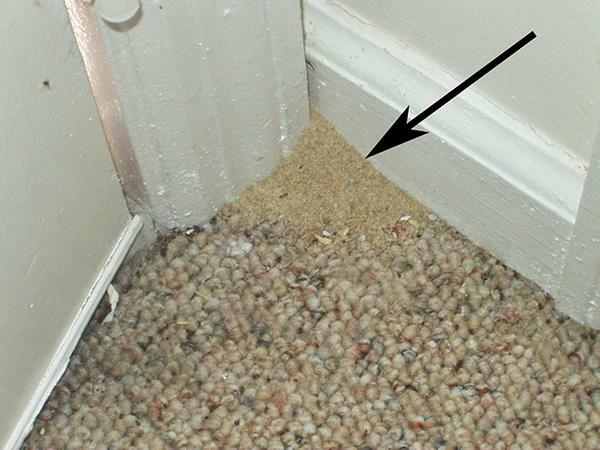 In those instances you will likely see soil and other debris pushed out around expansion joints near the edge of carpeting (image at right) or around water or other utility pipes. In most situations, fire ants are simply entering the building from an outdoor nest. In those situations, the treatment objective must be to reduce the potential for accidental stings as quickly as possible. Insecticides labeled for indoor use can be found in the North Carolina Agricultural Chemicals Manual. Particularly the pyrethroid insecticides (products containing chemicals such as cyfluthrin, bifenthrin, lamda-cyhalothrin, etc. ), can be used in homes and public buildings to drive foraging ants outside or away from high-use or critical areas, such as kitchens, recreation rooms, patient rooms, operating rooms, or intensive care units. Select products that are specifically labeled for use indoors. Although baits work well for many ant species that invade buildings, they are not the best choice for controlling fire ants indoors because they are more likely to draw more ants inside and potentially increasing the chance that someone will be stung. The best way to prevent indoor problems with fire ants is to control them outdoors when you find mounds. Fire ants feeding on hot dog slice. Trash cans in landscaped areas may serve as a food source for fire ants. Empty them frequently. 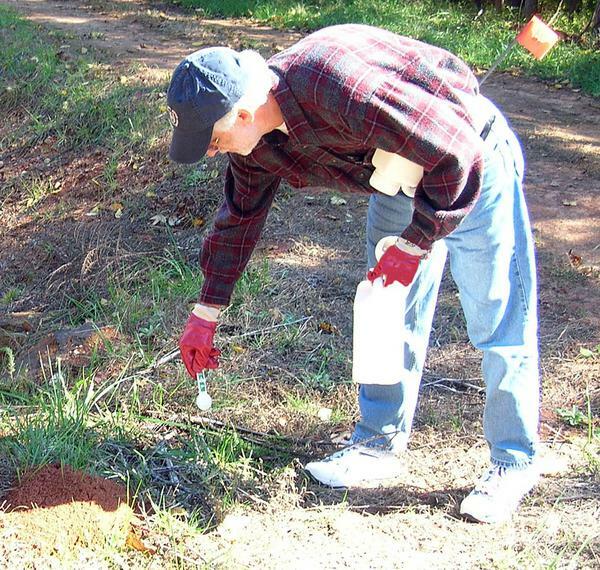 Applying a granular fire ant bait around a mound. There are some non-chemical methods available that can be used against fire ants; however, they may be limited in their effectiveness (or may be ineffective). Hot water (i.e., 90°F) and mechanical disruption have been used in many instances. Results of some preliminary evaluations at Texas A&M University have shown that these treatments will kill large numbers of ants; however, smaller satellite mounds formed by surviving ants frequently appear around the original mound. Thus, these methods can have a useful, but temporary impact on fire ant colonies in areas situations where pesticides of any type are considered unacceptable. Other non-chemical mechanical devices that disrupt colonies do not have scientifically-based test data to support their effectiveness. One potential downside to using hot water is that it can damage/kill vegetation in the general vicinity and can be hazardous to the person carrying hot/boiling water over uneven terrain. A long-standing folklore method of controlling fire ants (and other ants) has been to pour grits over the mound. The assumption in some cases has been that the ingested grit particles absorb water and cause the ants to "explode." Although ants carry away solid food particles, they actually feed on food that is liquified by the "brood" back in the nest. Results of laboratory studies at Texas A&M University have shown that foraging fire ants collect the grits, but there is no reduction in the number of ants in the colony. Research is underway to look at the use of biological control agents to control imported fire ants. These agents include parasitic flies and other ant species, as well as fungi and other microorganisms. These methods are somewhat effective as part of an IPM program, but they are not reliable or quick enough to deal with mounds that pose a imminent health health to people. 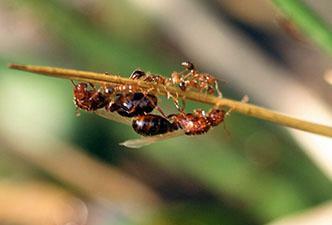 For more information about biological control of fire ants, visit this website. Since the major sources of new infestations outside the current fire ant range are often infested sod and nursery stock, limiting this source of ants is critical to slowing the spread of fire ants. The North Carolina Department of Agriculture & Consumer Services and the USDA-Animal and Plant Health Inspection Service (USDA-APHIS) cooperatively regulate shipments of nursery and sod farm items, such as balled nursery stock and turf, as well as baled hay and straw to areas outside of the quarantine zone. Under the terms of the compliance agreement, nursery operators have several ways to obtain certification and to ship nursery stock out of the quarantine zone. For information and assistance, contact the NCDA&CS.